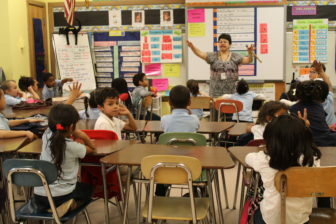 A classroom at DiLoreto Magnet Elementary School in New Britain, which receives federal Title I funds. The controversy pits teachers’ unions and many state departments of education, including Connecticut’s, against civil and human rights groups. The issue is whether school districts will be able to continue to substitute federal “Title I” money for local money to help bridge a funding gap between rich and poor schools. The Connecticut Department of Education, and the state’s teachers’ unions, want that flexibility. Civil liberties and human rights groups, and the U.S. Department of Education do not. They say the Title I money must “supplement” not “supplant” local funding of schools with large populations of poor and disabled students and those with limited English proficiency. The U.S. Department of Education is moving to finalize a new regulation that would prevent school districts from using Title I dollars instead of local dollars to close the gap between spending on rich and poor schools. But the Connecticut Department of Education says there are several problems with the proposed changes to the Title I program. Wentzell’s was one of more than 3,500 public comments on the new regulation, which the Obama administration wants to finalize before the president leaves office in January. Wentzell told the Connecticut Mirror, “The restrictive nature of the regulation does cause concern” and has urged the U.S. Department of Education to give school districts more flexibility when it issues a final rule. One problem, Wentzell said, is that existing programs aimed at helping disadvantaged students may not be funded in the future with federal dollars because that may be seen as “supplanting” local school funding. The debate has split Congress, with some lawmakers saying the U.S. Department of Education has overreached in interpreting the new education law, called the Every Student Succeeds Act, and others, including Sen. Chris Murphy, saying the change is needed to help disadvantaged children. Murphy, a member of the Senate Health, Education, Labor and Pensions Committee, helped write the section on Title I funding in the education bill. “I fought to level the playing field for low-income and disadvantaged students on the education committee, and continue to urge the Department of Education to write a strong rule that makes sure federal money goes to the students most in need,” he said. Connecticut received $122.4 million in Title I funding last year. “All districts in Connecticut receive Title I funding, but it’s a more significant source for some districts than others,” Wentzell said. The nation’s teachers’ unions also are concerned about the proposed changes in the Title I program. Hundreds of public comments were submitted by union members, some of whom were concerned that higher-paid, experienced teachers would be moved from one school to another to level out spending among schools in a district. Salaries are often the largest expense in a school budget. Lily Eskelsen García, president of the National Education Association, said focusing on variations in funding between schools in a district, “while relevant and important,” misses a larger picture of persistent disparities in total resources among school districts. She urged states to find ways to more equitably fund their schools. Meanwhile, a coalition of 25 civil and human rights groups has come up with a different legal analysis, finding that the U.S. Department of Education has “ample” legal authority to move forward with its proposal.